Philips Authentic Map of New Zealand Mounted on Cloth. This is a beautiful example of George Philip's 1888 pocket map of New Zealand and the islands of Polynesia. This is essentially seven maps compiled onto a single sheet. 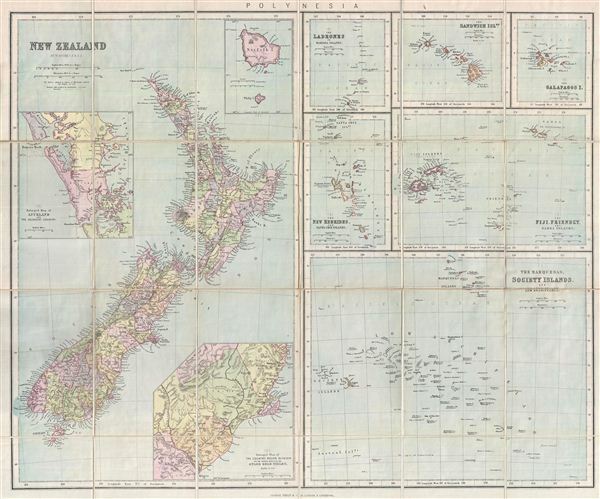 The left map, covering half of the sheet, focuses on New Zealand with three inset maps of Auckland and the adjacent country, the country around Dunedin and the eastern portion of the Otago Gold-Fields, and Norfolk and Philip Islands. The lower right section features a quarter-sheet map detailing the Marquesas (of Typee fame), Society Islands, and the Low Archipelago. Other maps in the upper right quadrant detail Fiji, the Friendly Island (Tonga) and Samoa, the New Hebrides and Santa Cruz Islands, the Ladrones or Mariana Islands, the Hawaii, and the Galapagos Islands (made famous by Darwin's discoveries). Throughout Philip identifies various cities, towns, rivers, mountains, and an assortment of additional topographical details with relief shown by hachures. Prepared by William Hughes F. R. G. S. and first published by George Philip & Sons. There is no date on this map, but Philip began advertising it in 1888, which corresponds to the style and printing techniques used. Very good. Dissected and mounted on linen. Original linen in good condition. Folds into linen binder.